No sign of a Brisbane man missing this week. 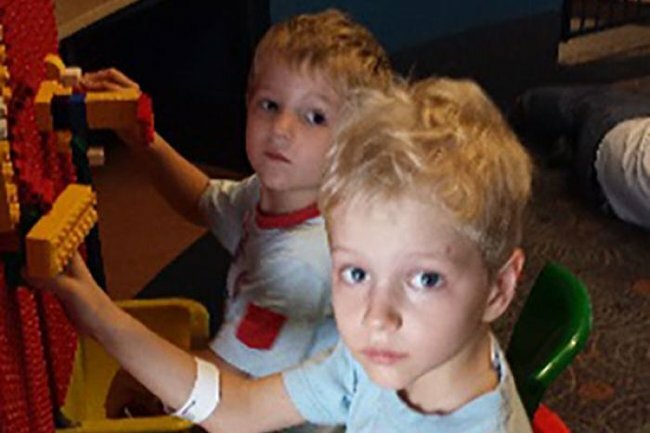 UPDATE: Father and two sons found alive and well. UPDATE: The Courier Mail is reporting that 37-year-old Steven Van Lonkhuyzen and his two sons, who has been missing since December 11, have been found alive and well. The trio, who set out on a road trip and were expected to arrive in Cairns on December 15, were found by a farmer when their car became bogged in Expedition National Park in central western Queensland. A police spokeswoman has confirmed that the farmer saw the father along with sons Ethan, 7, and Timothy, 5, drive into the national park but thought nothing of it until they were reported as missing. He drove into the park only to find them bogged up to their doors but alive and well, although a bit hungry. Previously ABC News reported that…. 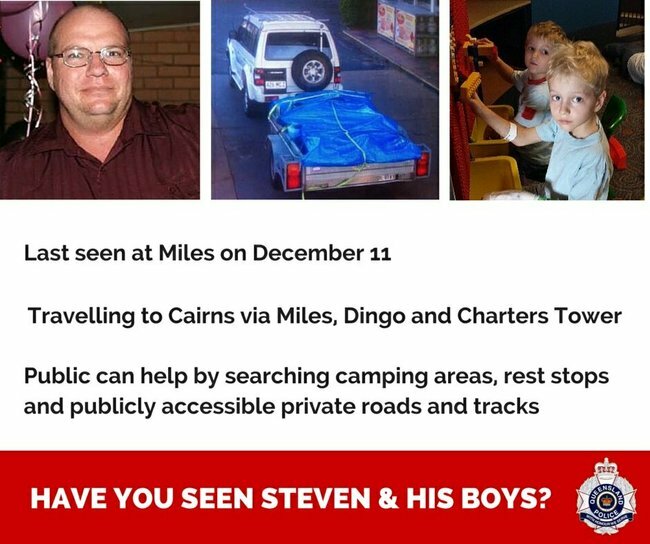 A Brisbane man and his two sons who have been missing for several days after leaving on a driving holiday to Cairns may be stranded in outback Queensland, police say. 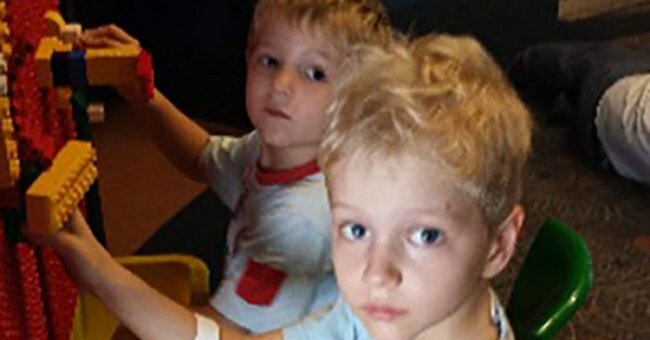 Steven Van Lonkhuyzen, 37, and his children Ethan, 7, and Timothy, 5, left their home at Lota on Brisbane’s bayside about midnight on Thursday, December 11. Police said the trio might be stranded in an off-road or isolated location after heavy rains across much of western and central Queensland over the past week. Ethan (front) and Timothy are travelling with their father. Source: ABC. Detective Acting Superintendent Owen Elloy said it was possible the trio had packed their trailer with camping gear and had headed off-road. “We have had police, including those from Miles, Wandoan and Taroom, patrol hundreds of kilometres of outback roads, as well as camp grounds and truck stops,” he said. “This is a vast geographical area that we are talking about and many roads are cut due to localised flooding or swollen creeks. “If Mr Van Lonkhuyzen has gone off-road onto isolated tracks or dirt roads it is possible that he and his sons have become stranded. CCTV footage of Steven Van Lonkhuyzen on December 11. Acting Superintendent Mick Bianchi said officers had already searched hundreds of kilometres of roads, many camping areas and national parks over the past few days. “This is a huge area, covering many thousands of square kilometres,” he said. 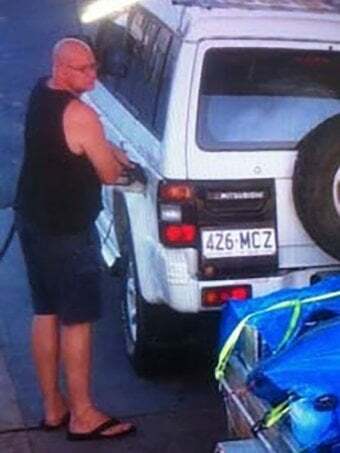 Police released CCTV images of the last sighting of Mr Van Lonkhuyzen at a service station in the town of Miles in Queensland’s southern inland on December 11. It is believed the trio were taking an inland route to Cairns, travelling via Miles, Dingo and Charters Towers. They were expected to arrive in Cairns on December 15 but have not made contact with family or friends since last week. 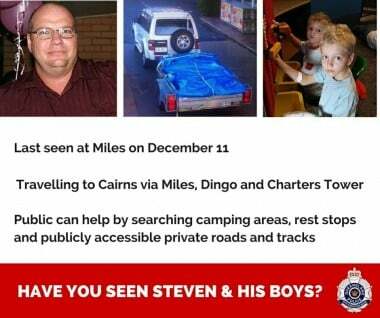 They are travelling in a 1995 model white Mitsubishi Pajero, Queensland registration 426 MCZ. When they left home they were towing a silver trailer, which was also visible when the car was spotted in Miles. Anyone who may have seen the family or the vehicle in the last week is urged to contact Crime Stoppers on 1800 333 000. This article originally appeared on ABC News and is republished here with permission.